If I see a recipe and the word "chipotle" is in the title, it's pretty much guaranteed that I'll make it. I just love the smoky-spicy flavor that chipotles give food. This was also an incredibly easy and quick dinner to throw together. AND I used the leftover corn muffins for the crust instead of plain cornmeal, which made the fish especially delicious. Win - win - win. 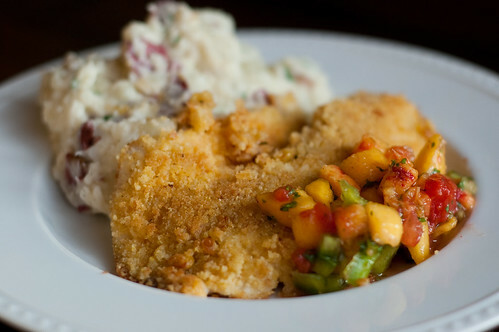 The peach salsa is a great accompaniment to the fish, and well, smashed potatoes go with just about everything. This was a great dinner, and it speaks volumes of the fish when Caroline finished that before even touching her mashed potatoes. I used tilapia since it was on sale, but I would also suggest, cod, catfish, or halibut. Any white fish would be great, Just be sure to adjust your cooking time based on the thickness of the fillet. For the salsa, mix together all the ingredients, and set aside for at least 10 minutes. Taste and season accordingly. Preheat the oven to 375 degrees. Lightly oil a large baking sheet with oil. Pat the fillets dry with a paper towel, and season with salt and pepper. In the bowl of a food processor, combine the chipotles, oil, lime juice, cilantro, garlic, thyme, and salt. Pulse a few times to combine. Pour the sauce into a shallow bowl or dish, and spread the cornmeal in a separate dish. Dip each fish fillet first into the chipotle sauce, then dredge in the cornmeal. Turn the fish several times to coat, and pat the fillets to adhere the crumbs. Arrange the fish in a single layer on the prepared baking sheet. Drizzle with a small amount of oil. Bake uncovered until the fillets are golden and the fish flakes easily with a fork. It could be as little as 10 minutes, or up to 25 depending on the type and thickness of the fish. For the last 2 minutes, turn on the broiler to acheive a crispy crust. Serve with peach salsa and lime wedges. 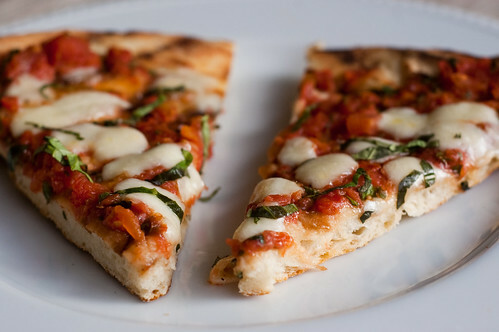 Pizza Margherita sounds so much fancier than "cheese pizza" doesn't it? This could also be called "caprese pizza." Its all the components of my favorite combination: tomatoes, mozzarella, and basil. An authenic pizza margherita is cooked in an 800 degree oven and needs 2 days of proofing to acheive a thin, crispy crust. I guess this is an imposter pizza because I just used my standard pizza dough. Still, its delicious. Its hard to mess up pizza. In a pinch, I've also used dough from Trader Joe's or the Publix deli with good results. As the grill is heating, prep the tomato sauce, cut the cheese (hee hee), and shape the pizza dough. Then its 10-15 minutes max to cook the pizza. With a salad this is the perfect light summer dinner. I know Friday night is pizza night for many families, so its not too late to plan this for dinner tonight! Add the tomatoes (with their juices) to the bowl of a food processor, and pulse several times to crush the tomatoes. Transfer the tomatoes to a fine-mesh strainer set over a medium bowl and allow to drain 20-30 minutes, stirring occasionally. Combine the drained tomatoes with sugar, 2 Tablespoons of basil, garlic, and 1/8 teaspoon salt. Meanwhile, preheat the grill to high heat (450-500 degrees) for at least 15-20 minutes. As the tomatoes drain, shape the pizza on a well-floured surface by flattening the dough into an 8-inch disk, pressing to eliminate air pockets. Stretch the outer edges with flattened fingers while giving quarter turns until the dough is a 12-inch circle. Allow to sit at room tempeature 10-15 minutes. Using a pastry brush, oil the dough well. Using a cutting board or pizza peel, transfer pizza, oil-side down, onto the grates of the grill. Cook 5-10 minutes, or until under-side of dough is golden-brown. Brush the top with more oil. Using 2 spatulas, carefully flip the dough. 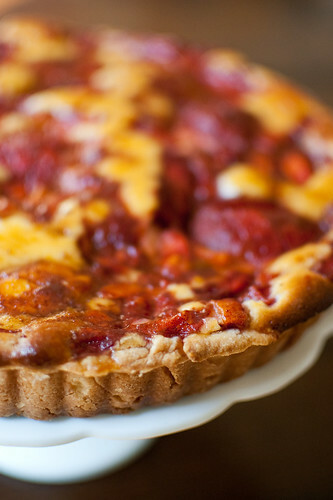 Working quickly, spread the tomatoes on the now-cooked side, then scatter the cheese evenly on top. Close the grill cover and continue too cook until the crust is cooked through and the cheese has melted. Carefully slide pizza onto a platter, and sprinkle with remaining basil, 1 teaspoon of olive oil, and a pinch of kosher or sea salt. Serve immediately. Ina Garten has a new cookbook coming out - it will be released in October, and is called How Easy is That? How Ina is that?? In case the title didn't give it away, its focus is straightforward recipes perfect for entertaining and everyday cooking. Tara, the brains behind Barefoot Bloggers, was offered an advanced copy of it to test out some recipes and share with her fellow blogging pals. 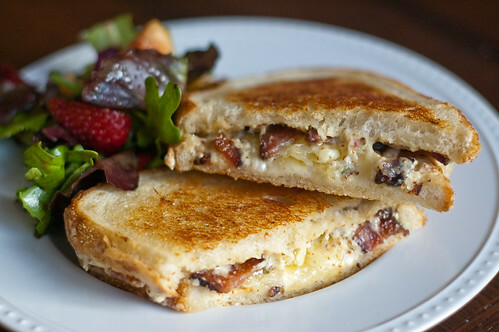 This month, we made Ultimate Grilled Cheese, as chosen by another one of my favorite bloggers, Rebecca of Ezra Pound Cake. When I saw the title of this recipe, I had to wonder what exactly makes it the "ultimate" grilled cheese. Well, you start with sourdough bread. Butter each piece. Then you spread each piece with an incredibly rich sauce of mayo, dijon, Parmesan cheese, salt, and pepper. Scatter some bacon on top of the sauce, then pile on extra sharp cheddar and Gruyere. So yeah, this sandwich doesn't mess around. Joey was really excited by this sandwich. Me? Well it was certainly delicious of course. It was a tiny bit too rich for me though, especially since I'm not the biggest fan of mayo (even though I actually decreased it when I made it). I think if I had stopped at half a sandwich I would have been better off. Still - add bacon, cheddar, and gruyere to anything and you can't go wrong. I'm just glad I served it with a light salad. If you're interested to see what else will be included in Ina's latest cookbook, head over to Smells Like Home and check out what she's made so far. And I for one can't wait to pick up a copy come October! Ina Garten, How Easy is That? Preheat the oven to 400 degrees. Line the bacon on a rack set over a baking sheet, and bake for 20-30 minutes, or until browned and crispy. Transfer to a paper towel-lined plate and allow to drain, then chop into 1-inch pieces. Meanwhile, make the sauce. Mix together the mayonnaise, mustard, salt and pepper, and Parmesan. Combine the Gruyere and cheddar in a medium bowl. Spread the sauce on each slice of bread, then top half the slices with bacon. Top the bacon with 1/3 cup of cheese. Form sandwiches, pressing each one down. Butter the top half of each sandwich. Melt 1-2 Tablespoons of butter in a large nonstick skillet, and grill have the sandwiches buttered-side up, flipping after a few minutes. Repeat with remaining sandwiches. Serve immediately. When I saw last that week's Project Pastry Queen selection was corn muffins, the first thought I had was "gumbo." I have been eyeing a gumbo recipe in The Lee Bros. Southern Cookbook, and I fully intended to make it on Saturday night. But that morning, we went to the farmer's market, and then followed it up with an outdoor bbq festival. So yeah, not really feeling heavy, hot stew that night after spending all day in the heat. Luckily, I'd had this recipe for gumbo salad saved for a few weeks, and this was the perfect time to bust it out. In short, we loved this salad. Great flavor from the shrimp, okra, peppers, and onions, then nice fresh bursts of flavor from the tomatoes, and all pulled together by a delicious fresh corn vinaigrette. It was quick to throw together, and didn't dirty up too many dishes either. Which makes it a double-winner in Joey's book. Prepare grill to medium-high heat (350-400 degrees). Toss the shrimp with 1 tablespoon of olive oil and 1 teaspoon of the cajun seasoning. Thread the shrimp onto skewers and sprinkle lightly with salt and pepper. To make the vinaigrette, combine the corn, oil, lemon juice, garlic, vinegar, mustard, and thyme in a food processor. 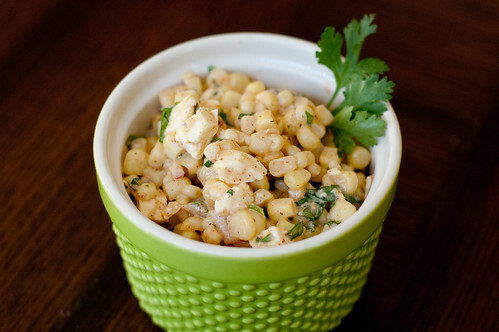 Pulse several times, until the dressing is combined and the corn has been coarsely chopped. Taste and season with salt and pepper. Set aside. Trim the tops of the okra and cut in half length-wise. Toss with onion, corn, and bell pepper on a baking sheet with the remaining tablespoon of oil and remaining teaspoon of Cajun seasoning. Grill vegetables on a grill pan, tossing occassionally, until charred and tender. The okra will take less time than the onion and bell pepper. Turn the corn ever 2-3 minutes, or until lightly charred. Grill shrimp 2 minutes per side, or until pink cooked through. Coarsely chop the bell pepper, and halve the onion slices. Cut the kernels off the corn. Remove the shrimp from skewers. 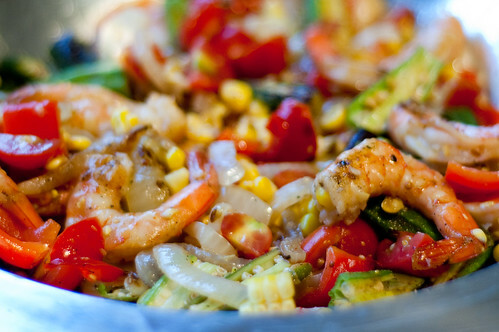 Combine the shrimp, grilled vegetables, tomatoes, and half the corn vinaigrette in a large bowl. Toss well to combine, add more vinaigrette if needed, and serve warm or at room temperature. Last week I decided I was overdue for some homemade ice cream, so I sat Joey down with The Perfect Scoop and told him to pick out a recipe. His choice? Well, it wasn't this one. I'll get to his next week. It just so happened that I had about a pound of plums, perfectly ripe and just waiting to be eaten, and wouldn't you know that David Lebovitz has a recipe for plum ice cream. 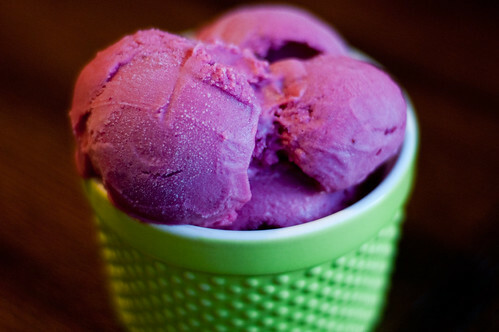 David suggests pairing this ice cream with a raspberry or blackberry swirl, which I think is a fabulous idea. I even had some of both in my fridge, but I was crunched for time and skipped it. I would love to try it out though! I added a step to strain the puree to get rid of the skins before chilling. I just thought I'd prefer it smooth. I also decreased the sugar just a tad, since the plums I used were really really ripe. And since I didn't have any kirsch, I added a bit of almond extract instead. We really enjoyed this ice cream. Its a bit of an unusual flavor, but it tastes very rich and smooth. Caroline and my niece both really loved it as well - and I'm sure it had nothing to do with its brilliant purple hue. Slice the plums in half and remove the pits. Cut each plum into eighths, and place them in a medium saucepan with the water. Cover and cook over medium heat, stirring occasionally, about 8 minutes. Remove from the heat, stir in the sugar, and cool to room temperature. Puree in a blender or food processor with the cream and almond extract until smooth. Strain through a fine-mesh sieve into a medium bowl, and cover with plastic wrap. Chill the mixture thoroughly, then freeze according to your ice cream maker's instructions. 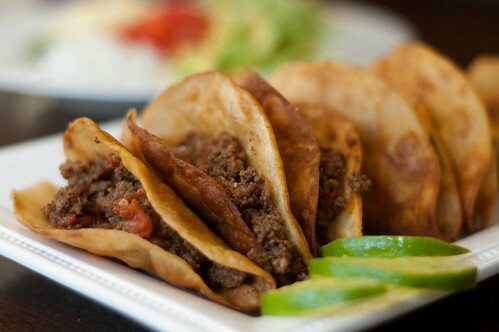 Its easy to overlook something as simple as beef tacos when planning your weekly menu. Or to just throw it on there as an afterthought for a quick and easy dinner. Ground beef, taco seasoning, and store-bought shells. Done and done. To be honest, that has never really been one of my favorite dinners, and I don't know when the last time I bought taco shells was. If I'm going to cook Mexican food, I'm making chicken enchiladas, quesadillas, or burritos. Well, now I'll be adding these tacos to my favorite Mexican meals. The whole time we were eating I just kept saying over and over again how good they were. 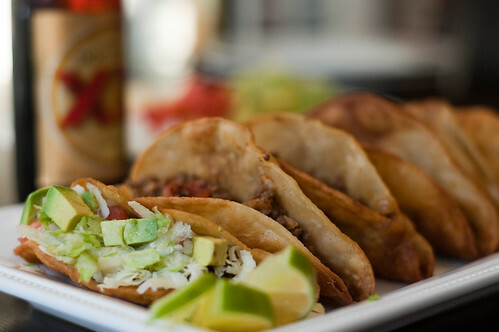 The secret of these tacos lies in the homemade seasoning and the home-fried taco shells. I've been making my own taco seasoning for quite some time now, but the spices and seasonings used here were pretty much perfect. I'll also never buy a taco shell again now that I have this recipe. Yes, it was a little time consuming, and I hate to say that its worth it, since I know everyone has different limits, but well, they were worth it. Crunchy on the outside, with a little chewiness inside. Once you get the hang of shaping them it goes quite quickly, and I really don't mind just mentally checking out for a bit at the end of a long day. It was actually a little therapeutic. The shells can also be made ahead of time and reheated in the oven, which makes these tacos ideal for entertaining. I'm listing the toppings I used, but feel free to mix them up or add whatever suits your tastes. Sliced jalapenos, salsa, black olives, or guacamole would all be great as additional toppings as well. Heat oil in a large nonstick skillet until shimmering. Add the onion and cook, stirring occasionally, until softened, about 4 minutes. Add the garlic, spices, and 1/2 teaspoon salt. Cook, stirring constantly, until fragrant, about 1 minute. Add the ground beef and cook, breaking up meat with a wooden spoon and scraping the bottom of the pan to prevent scorching, about 5 minutes longer, until meat is no longer pink. Add tomato sauce, broth, brown sugar, and vinegar; bring to a simmer and reduce heat to medium-low. Simmer uncovered, stirring frequently, until liquid has reduced and thickened, about 10 minutes. Adjust seasonings with salt and pepper and set aside to keep warm. Meanwhile, fry the shells. Heat oil in an 8-inch heavy-bottomed skillet over medium heat to 350 degrees, about 5 minutes. You can test by dropping a small piece of tortilla into the oil. It should bubble and the tortillas should rise to the surface within 2 seconds. Line a baking sheet with a double layer of paper towels. Using tongs to hold the tortilla, slip half the tortilla into the oil. With a metal spatula in the other hand, hold the tortilla in the oil, at a 90 degree angle to the top half. Fry until just set but not brown, about 30 seconds. Flip the tortilla, and hold it open about 2 inches while keeping the bottom half submerged in oil. Fry until golden brown, about 1 1/2 minutes. Flip again and fry the other side until golden brown, about 30 seconds. Transfer shells to the baking sheet and lay upside down to drain. Repeat with remaining shells. When all the tortillas have been fried, divide the filling evenly among the shells. 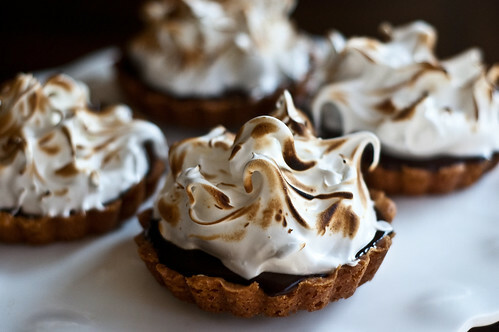 Serve immediately, passing the topping separately. Earlier in the summer, we took Caroline to visit my grandpa (who is the best grandpa in the entire world), and Caroline was introduced to lemonade for the first time. We were all outside, sipping lemonade, and Caroline came begging for a taste. I let her try it, and as she was walking away, the sweet-tart drink hit her, and she stopped in her tracks, turned around and came sprinting back for more, "yumming" the whole time. It was one of the funniest things she's ever done, and we still laugh when we think about it. Her life will never be the same. Needless to say, this particular recipe was a hit with my 2 year old! This week's recipe was chosen by Ashley of Delish. I had actually been eyeing this recipe all summer, and I'm glad I got the chance to try it out. I thought it would be watermelon puree mixed with lemon juice, but its actually just basic lemonade with watermelon chunks. However, as the lemonade sits, they begin to break down and the lemonade starts to turn pink. The recipe also calls for chunks of other fruits to be mixed in, but I decided to keep it simple this time. I think peaches and strawberries would be wonderful though. The lemonade is sweet, tart, and totally refreshing. 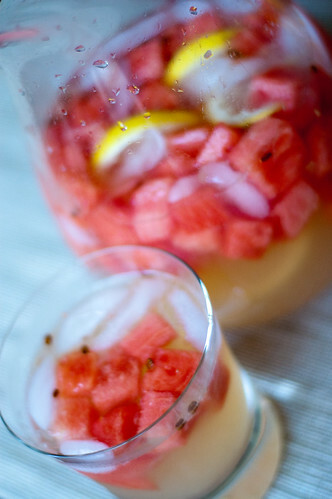 The perfect summer drink, which I think could also be the base for a fabulous sangria! 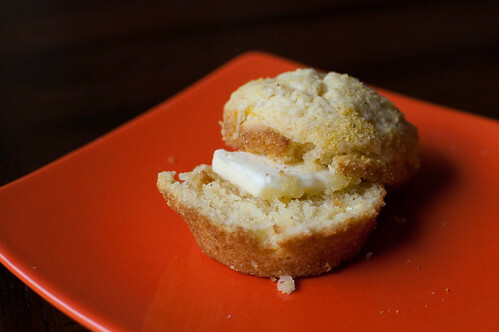 Check out Ashley's blog for the full recipe, and check back next week for some rather rich corn muffins! The August issue of Bon Appetit is full of recipes that I can't wait to try. I've already blogged the blueberry cobbler, and I have a whole backlog of recipes to try before the seasons change and I lose access to my beloved tomatoes, zucchini, corn, and berries. This pesto is pretty interesting. I don't know that I've ever made pesto from anything other than basil or roasted red peppers, but I really liked the corn variation. It tastes very fresh, with a little sweetness from the corn, and then the typical "pesto-y" flavors from the pine nuts, basil, garlic, and Parmesan. I made fresh pasta, which I really prefer if I'm serving it with a sauce that is as simple as this. When you only use a few ingredients and components, I truly think its important for them to all be of good quality. It will really take the dish to a whole new level. This is also an incredibly quick dish, especially if you already have pasta on hand. Super easy, flavorful, and simple. Summer cooking at its finest. Cut each bacon slice in half length-wise, then crosswise into 1/2-inch pieces. Cook in a large nonstick skillet over medium heat until crisp and brown, then transfer to a paper towel-lined plate to drain. Pour off all but 1 Tablespoon of the fat. Add the corn, garlic, salt and pepper to the skillet, and saute until the corn is just tender, but not brown, 3-5 minutes. Transfer 1 1/2 cups of the corn to a small bowl and reserve. Transfer the rest to a food processor, and add the pine nuts and 1/2 cup of Parmesan. With the machine running, slowly stream the oil through the feed tube and blend until pesto is almost smooth. Set aside. Cook pasta in a large pot of boiling, salted water until just tender, but still firm to the bite (not quite as done as you would want it). Reserve 1 1/2 cups of the pasta water and drain the pasta. 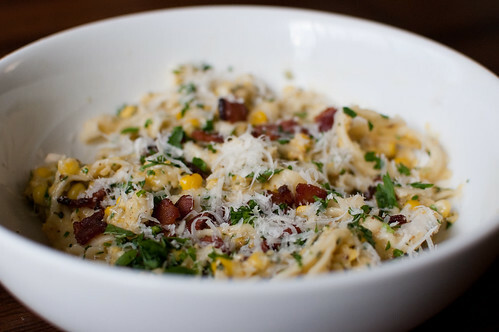 Return pasta to the pot and add the pesto, reserved corn kernels, and 1/2 cup fresh herbs. Toss well and add pasta water 1/4 cup at a time until the desired consistency is reached. Cook an additional 2-3 minutes, or until pasta is cooked through. Season with additional salt and pepper if needed. 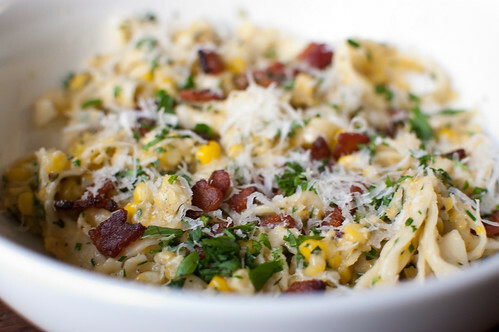 Divide among serving bowls and sprinkle with additional herbs, cheese, and reserved bacon. Even though I'm not a huge meat-eater, I do love a good burger. I love mixing things up and trying out new and different variations. Lucky me, July's Southern Living has a whole spread of Top-Rated Burgers. These were the first ones that stuck out at me. I absolutely love figs. One of my strongest childhood memories is going to my grandpa's house and picking figs off his tree, then eating them right there in the yard. And since my grandpa is pretty much my favorite person in the world, figs will always be a favorite as well. These burgers start out with a patty seasoned with herbs and spices, then is grilled, glazed with fig preserves, and topped with Meunster cheese. As the burgers cook, a red onion jam is made by sauteeing onions with a little sugar, vinegar, and thyme. And just so you know, the leftover onions make phenomenal grilled cheese sandwiches. 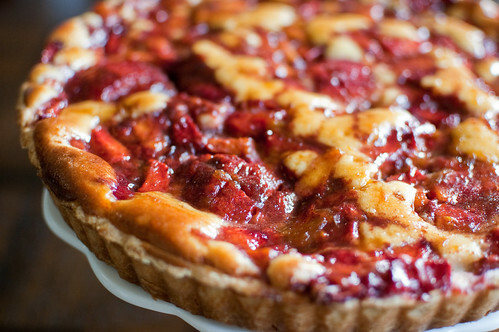 The result is a perfect combination of sweet, salty, and tart. Joey said this is his new favorite burger, so I have a feeling they'll be making regular appearances in our house. Saute the onions in hot oil over medium-high heat in a large skillet for 10 minutes. Stir in the sugar, vinegar, and thyme, reduce heat to low, and cover and cook an additional 10 minutes, or until onion is very tender. Remove from heat and keep warm. Prepare grill and heat to medium-high (350-400 degrees), and grease grates with vegetable oil using a paper towel and tongs. Gently stir together all the ingredients for the burgers (through black pepper) and shape into 4 (1/2-inch) patties. Grill patties 5 minutes on each side. Brush each patty with fig preserves and top with a slice of cheese. Grill an additional 2 minutes, or until beef is cooked and cheese is melted. 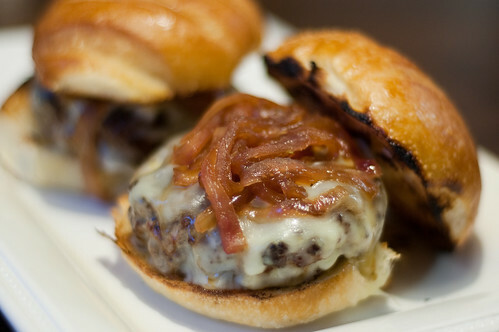 Serve on buns with red onion jam. I hope you guys aren't getting tired of peach recipes, because I fully intend to bombard you with them until the cruelly short peach season is over. They are by far my favorite fruit, and I love eating them in savory dishes, sweet, dishes, and over the kitchen sink (with the fuzz peeled off of course - who eats the skin?). 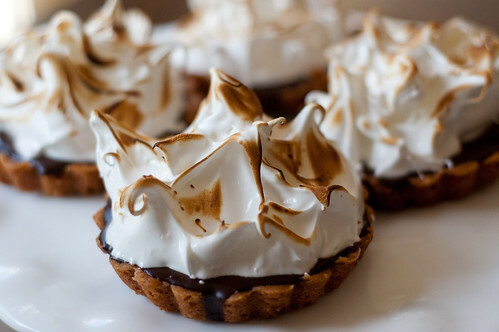 When I first bought The Pastry Queen last summer, this was one of the first recipes that stuck out to me. Why I never made it last summer, I don't know. So when Tara chose it for this week's Project Pastry Queen recipe, I was stoked. This isn't a last-minute dessert, as you need time for the dough to chill, mixing up the filling, peeling, pitting, and scoring the peaches, baking the tart, glazing, and finally chilling the tart. But its all pretty basic, and the result is definitely worth it for me. This is what I would classify as a "cheesecake tart," as it basically tastes like a cheesecake baked in a pastry crust in a tart shell. And that's most definitely not a bad thing. 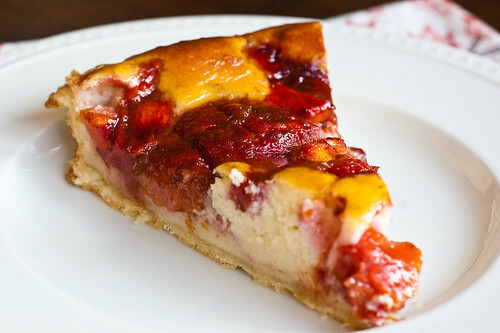 The sweet cheesecake filling is cream cheese and mascarpone based, topped with peaches that have been coated in cinnamon-sugar, and then brushed with an apricot-brandy glaze. 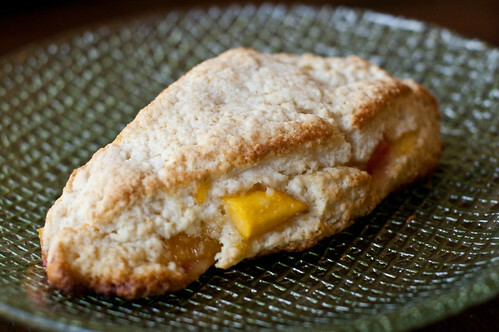 The peaches are sweet and caramelized, and the filling is perfectly sweet and tangy. This is definitely a dessert to impress. Tara has the full version posted on her blog, Smells Like Home. Next week, we're cooling down with Watermelon Lemonade! One Year Ago: My most popular post ever! Chicken Enchiladas! Last week we were on vacation with Joey's college roommates, and we had the best time! Caroline had friends to play with, Joey had friends to play with, and I got to read 4 books in the span of a week - a good time was had by all. The day we returned, both of my sisters happened to be coming through Atlanta on their way to Europe, so we had a girls' night at my house. I was kind of stressed about what to make for dinner since I didn't have much prep time, or much energy, but in the end it all worked out. I served Garlic-Mustard Glazed Pork Tenderloin, Summer Vegetable Gratin, and Twice Baked Potatoes. For dessert, I made this blueberry cobbler. 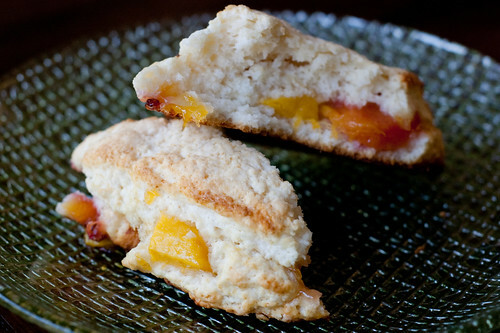 Bon Appetit claims these are the easiest-ever biscuits, and they are pretty darn easy. Flour, salt, and sour cream are the only ingredients. The sour cream really gives them a great tangy taste, while keeping them nice and tender at the same time. This was a perfect dessert to make in my time-crunch. It was in the oven and baking in less than 30 minutes, and is obviously delicious. The original recipe called to serve with sour cream or creme fraiche, but that didn't seem as appetizing as vanilla ice cream. 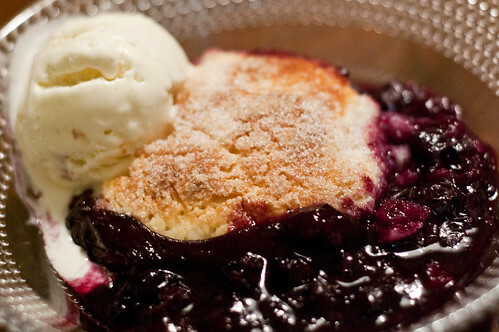 Plus, cobbler + vanilla ice cream is a perfect combination in my opinion. And on an unrelated note, I've updated the Featured Recipes page with lots of fun grilling recipes. Check it out! Combine the blueberries, sugar, water, cornstarch, lemon juice, lemon zest, cinnamon, and salt in a saucepan. Whisk over medium-high heat until cornstarch dissolves. Bring to a boil, stirring occasionally. Reduce heat to medium-low and simmer 3-4 minutes, until thickened, stirring constantly. Transfer to a lightly greased 11x7x2 inch baking dish. Combine the self-rising flour and salt in a medium bowl. Add the creme fraiche, and stir until a soft dough forms. Form a ball with the dough and turn out onto a lightly floured surface. Shape the dough into a 10 to 12-inch log, and cut crosswise into 6 rounds. Pat each round into 3/4-inch thick 3-inch disks. Arrange biscuits atop filling and sprinkle each biscuit with 1/2 tablespoon of sugar. 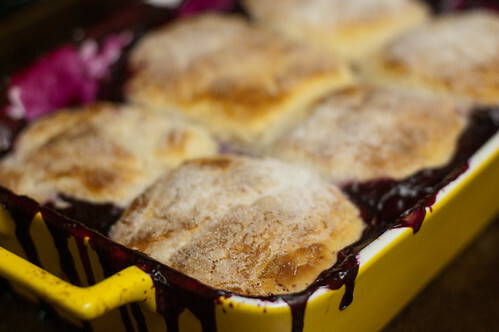 Place baking dish on a rimmed cookie sheet and bake cobbler until bubbling and golden, about 25 minutes. Cool at least 15 minutes before serving. Elote is a popular street food in Mexico. corn on the cob that is slathered in crema or mayonnaise, chile powder, and cheese, then grilled in the husk. I have had a variation of it before, and while I don't like mayonnaise, I really enjoyed the dish. This salad is a deconstructed version of the original dish. I have made this at least 5 times this summer, and with all the beautiful corn coming into season, I'll definitely be making it more and more. We eat a lot of Mexican-inspired food, and sometimes the sides stump me. I know the traditional sides are rice and beans, but since Mexican food can sometimes be on the heavier side, I like serving something light on the side. This corn salad and guacamole salad are my standbys, and I see no reason to go back to rice and beans when I have these delicious, healthy, and flavorful dishes in my repertoire. Since I don't really care for mayonnaise, I sub at least half for Greek yogurt. I also have used feta and queso fresco when I couldn't find cojita. Any mild crumbly cheese will work well. Bell peppers are a nice addition, and I always add cilantro as well. Prepare grill, and brush the corn with oil. Combine the garlic, onion, and lime juice in a medium bowl and toss to coat. Allow to stand for 10 minutes. Whisk the mayonnaise (or yogurt) and chile powder into the onion mixture. Set aside. Grill the corn 10 minutes, turning every 2-3 minutes, until lightly charred and tender. Allow to cool slightly, then cut the kernels off the cobs and add to the dressing. Toss with the cheese and cilantro, mixing well to coat with the dressing. Season with salt, pepper, and hot sauce. Serve with additional hot sauce if desired. Even squash haters like my sister think its very tasty. It can be a side or light main dish. Its not the fastest dish to throw together, but most of the time is inactive time, just waiting for the vegetables to drain off their excess moisture. A step I wouldn't recommend skipping unless you really like soggy, waterlogged vegetables. I've now made this twice in the last 2 weeks, and I have plans to make it as much as I can before all the good veggies are gone! Adjust the oven rack to the upper-middle position and heat the oven to 400 degrees. Lightly oil a 9x13 inch baking dish and set aside. Toss zucchini and squash slices with 1 teaspoon of salt in a large colander, and allow to drain about 45 minutes, or until they release 3 Tablespoons of liquid. Arrange slices on a triple layer of paper towels or a dish towel, cover with a clean dish towel, and press firmly to remove as much moisture as possible. As the squash and zucchini drain, line another dish towel with the tomatoes, and sprinkle with 1/2 teaspoon salt. Allow to stand 30 minutes, then using a clean dish towel or paper towels, press firmly to dry the tomatoes. Meanwhile, heat 1 Tablespoon of the oil in a 12-inch skillet over medium heat until shimmering. Add the onions, 1/2 teaspoon salt, and 1/4 teaspoon pepper. Cook, stirring occasionally, until onions are softened and dark golden brown, about 20 minutes. Set aside. Combine the garlic, 3 Tablespoons of oil, 1/2 teaspoon pepper, and thyme in a small bowl. Whisk to combine. In a large bowl, toss the squash and zucchini with half the garlic-oil mixture. Arrange in the baking dish, then top with an even layer of the onions. 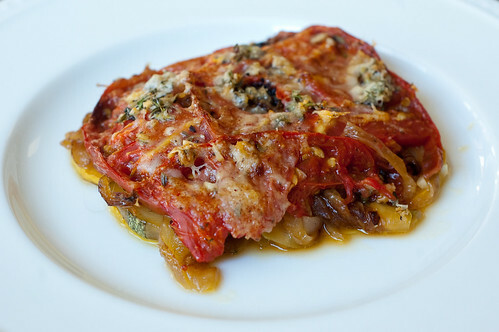 Slightly overlap the tomato slices in a single layer over the onions, and drizzle with the remaining oil mixture. 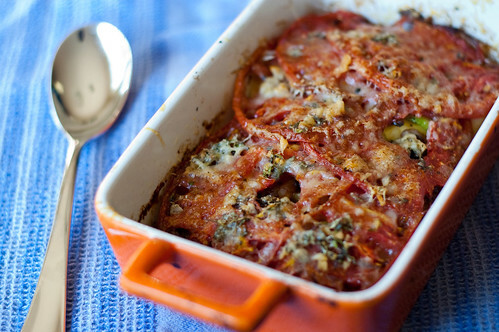 Bake until the vegetables are softened and tomatoes are starting to brown around the edges, 40-45 minutes. As the vegetables cook, pulse the bread in a food processor until finely ground (You should have about 1 cup of crumbs). Combine the bread crumbs, Parmesan, 1 Tablespoon oil, and shallots in a medium bowl. Remove the baking dish from the oven and increase the heat to 450. 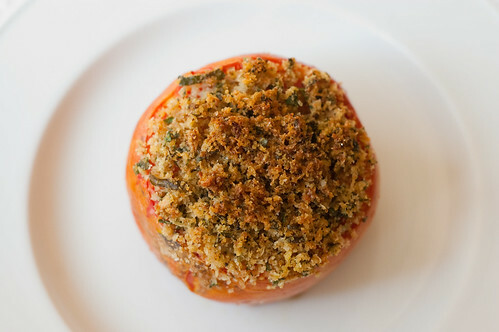 Sprinkle the bread crumb mixture over the vegetables, and bake gratin until bubbling and lightly browned, 5-10 minutes. Remove from oven and sprinkle with basil. Allow to sit at room temperature 10 minutes before serving. Shrimp is one of my favorite proteins to cook. Its easy, cheap, and quick. And it can be so elegant, thereby making it a perfect meal for a special occasion or for entertaining. This shrimp certainly falls in that category. Shrimp are seared, then cooked in a flavorful sauce of sherry and clam juice, and seasoned with shallot, parsley, lots of garlic, and a pinch of red pepper flakes. 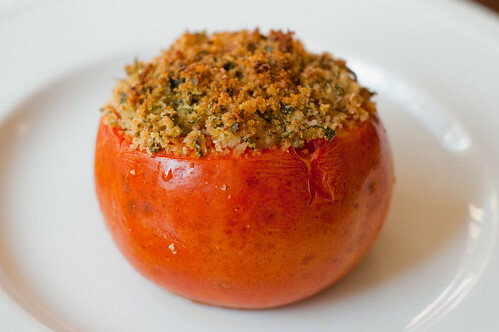 They are then topped with toasted buttery breadcrumbs. I was blown away by this meal. So much so, that I'm adding it to my menu next week - and I rarely repeat recipes that soon! Pulse the bread in a food processor until coarsely ground (you should have about 1 cup of crumbs). Thoroughly dry the shrimp with paper towels; toss with sugar, 1/4 teaspoon salt, and 1/4 teaspoon of pepper. Set aside. Melt 1 Tablespoon of the butter in a 12-inch nonstick skillet over medium heat. When the foaming subsides, add the crumbs, shallot, 1/8 teaspoon salt, and 1/8 teaspoon pepper. Cook, stirring often, until the crumbs are golden-brown, 7-10 minutes. Stir in 1 tablespoon of the parsley and transfer to a plate to cool. Wipe out the skillet with a paper towel. 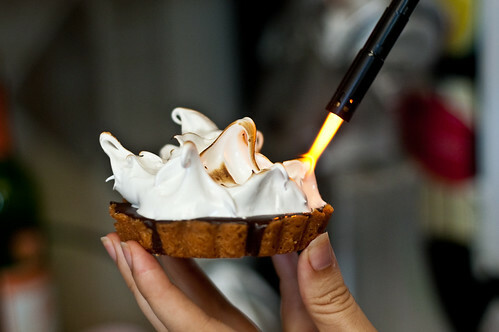 Return to high heat, and 2 teaspoons of the oil, and heat until shimmering. Add half the shrimp in a single layer, being careful not to overcrowd the skillet. Cook until they are spotty brown and the edges turn pink, about 3 minutes (do not flip them!). Remove the skillet from heat and transfer the shrimp to a plate. Wipe out the skillet, and repeat with the remaining shrimp and oil; transfer to the plate. Return the skillet to medium heat and melt 1 Tablespoon of butter. Add the garlic and red pepper flakes, and cook, stirring constantly, until fragrant and just beginning to color, about 1 minute. Add the flour and cook, stirring constantly, for 1 minute. Increase the heat to medium-high and slowly whisk in the sherry and clam juice. Bring to a simmer and cook until the mixture has reduced to 3/4 cup, about 3-4 minutes. Whisk in remaining 3 Tablespoons of butter, 1 tablespoon at a time, and stir in lemon juice and remaining tablespoon of parsley. 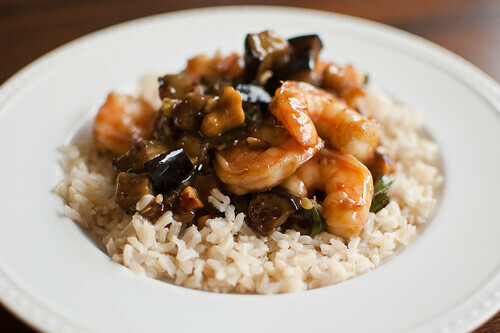 Reduce heat to medium-low, return shrimp to skillet, and toss to combine. Cover and cook until shrimp are pink and cooked through, 2-3 minutes. 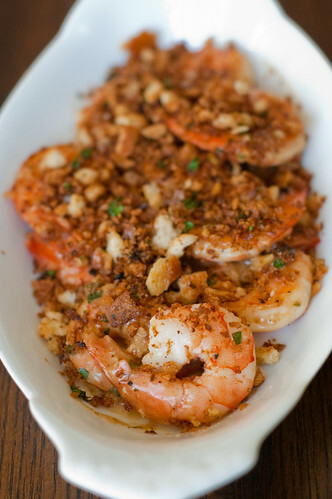 Divide shrimp and sauce evenly among plates or shallow bowls, and sprinkle with the bread crumbs. Serve with lemon wedges.